The GEM's roots are showing, I'm afraid, but don't worry - they've come a long way off the golf course. 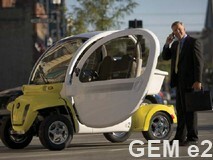 One more thing I'll mention before we get to the features: GEM stands for Global Electric Motors, they have teamed up with Polaris to produce these now, and this is a neighborhood electric car. Range: 30 miles on a charge, BUT they have regenerative braking, which feeds energy back into the battery when you use your brakes. Speed: 25mph is the top speed. There's a high speed and low speed setting. Battery: The usual. Six twelve-volt lead-acid batteries, like the ones you used to start the Buick. Charger: Comes with a standard onboard 110v charger for a six to eight hour charge up. A GREAT new option on the 2007 models is a FAST CHARGER. You can charge them up in an hour, and it's also ONBOARD... ...and comes with a special plug-in station that can be installed at home or wherever. Warranty: Comes with a 12 month limited warranty. You can buy another 12-24 month extended warranty, including roadside assistance and towing, if you choose. Not that it's likely you'll break down with an electric car, but if you do, and you live within their service area, GEM has VANS loaded with technicians and tools that come right to you! Custom Ordering: You can order these bad boys right off the website. Model? click. Add doors, click. Add Alpine stereo system and heated seats, click. It tallies up the total as you go. Price: Loosely, between $7,000-$12,000 base price, depending on the model. Operating Costs:Always depends on how much electricity costs per kilowatt hour in your neighborhood, but we're talking about pennies per mile, not dimes. This company is an Energy Star Partner, which tells you they worked at energy efficiency. Visit the Global Electric Motors website for more information. ...and finally, one more video to show you how GEM owners can beef up their motors to run at the higher speeds that are legal in more and more states these days. I want one of these! What a great little car! 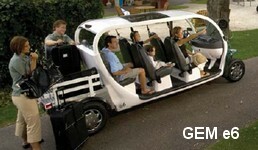 Return from GEM electric cars to Neighborhood Electric Cars.